Back in the good old days, farming was easy. Throw some seeds in the ground, keep it watered, pray to your preferred deity to spare your crops from pestilence and wait for harvest season. But with the global population closing in on 7 billion mouths to feed, humanity is going to have to figure out how to grow more food using less land and fewer resources, and soon. 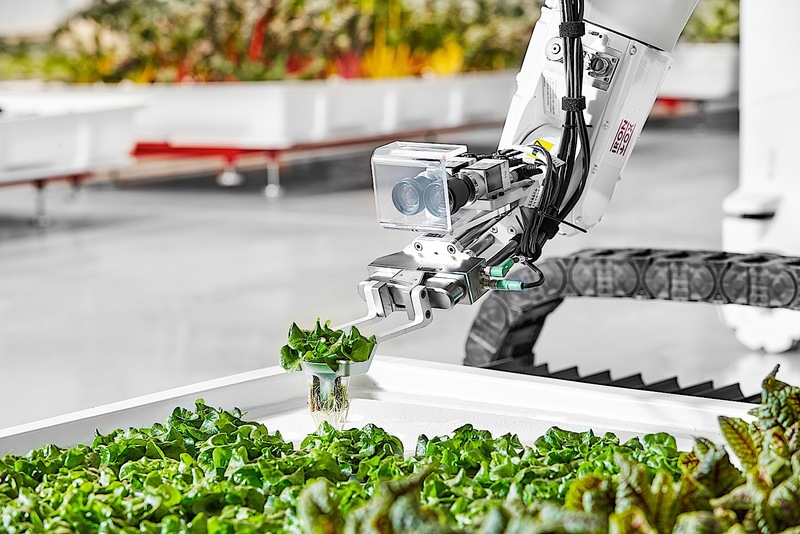 So while some researchers and equipment manufacturers are devising intelligent agricultural implements that will toil in tomorrow's fields on our behalf, others are aiming to bring futuristic farms to urban city centers. "Over three billion dollars were lost in California alone [in 2017], because there's not enough people to actually do the operations in seeding or harvesting," Brandon Alexander, co-founder of Iron Ox Robotic Farms, told Engadget. "The average age of the farmer now is 58. And so one of the big issues just plaguing farming is that there's just not enough labor to go around. The problem is getting worse every year." Vertical farming is the practice of stacking plants above one another to grow in a closed and controlled environment. Among the earliest imaginings of these agricultural towers can be seen in a 1909 Delirious New York passage extolling "the Skyscraper as Utopian device for the production of unlimited numbers of virgin sites on a metropolitan location." 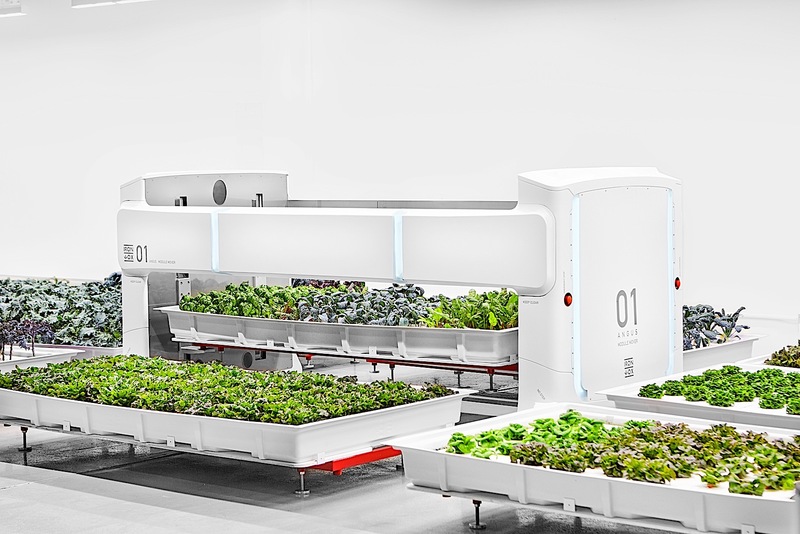 Since these grow systems are conducted indoors, with high production density and low footprint requirements, they can be set up in locations that would be unsuitable for conventional farms -- most anywhere, really. This reduces the amount of shipping and handling produce must undergo to get from the "field" to your kitchen counter, resulting in fresher and healthier fruits and vegetables. Even here in the US, with California's massive agricultural output, produce travels around 2,000 miles on average before hitting store shelves, according to Bain & Co, a management consultancy firm, speaking with Bloomberg Businessweek in 2017. Overall, America imports more than a third of its produce. With the shorter trip from farm to table, growers will be empowered to choose plant varieties that highlight taste and flavor over shelf-life and longevity. Additionally, growing indoors drastically reduces the prevalence of pests and the tightly-controlled environmental factors reduces the amount of water and nutrients required by as much as 90 percent. While indoor grows are extremely efficient once they are up and running, the initial setup costs for these operations are quite high. As such, it takes an inordinate amount of time for these companies to reach profitability -- seven years on average according to the Agrilyst study. Indoor grow operations must also contend with high energy costs generated by the need to run supplemental lighting for between 9 and 16 hours a day. Luckily, recent advancements in LED lighting technology have brought about a steady decline in power consumption. Labor is, however, far and away the biggest cost for indoor grows, constituting between 50 and 80 percent of a company's expenses, according to Agrilyst. A number of startups are addressing that issue through their extensive use of automation technologies. San Francisco-based Plenty Unlimited Inc. is one such outfit., Plenty operates a 50,000-square-foot farm capable of producing up to 2 million pounds of fresh lettuce annually. The company is able to accomplish this through its liberal employment of 7,500 infrared cameras and another 35,000 environmental sensors that measure everything from temperature and humidity to air quality and CO2 levels. All of this information is then fed into Plenty's AI "brain" which routinely tweaks those variables to improve growth rates and taste, depending on the plants' current growth cycles. The company made its public debut at the 2018 Outside Lands festival this August, offering attendees of the three-day concert festival samples of its produce. Plenty is also planning to launch a box subscription service later this year, enabling Bay Area residents to receive shipments of the company's wares direct to their doorsteps. Eventually, the company hopes to open similar-sized farms on the outskirts of more than 500 major metropolitan areas around the world. Iron Ox takes that production model a step further by replacing human labor with robotic in nearly every aspect of the grow cycle. 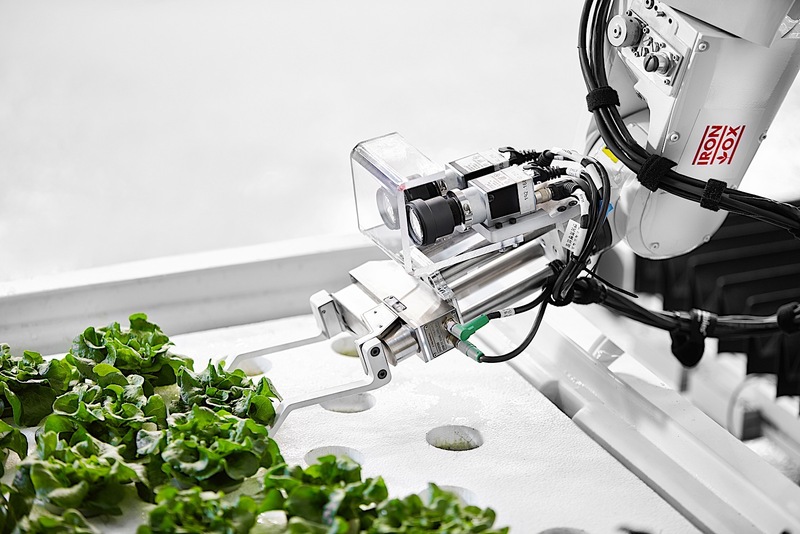 "We've designed our entire grow process with a robotics-first approach," Alexander said in a press statement. 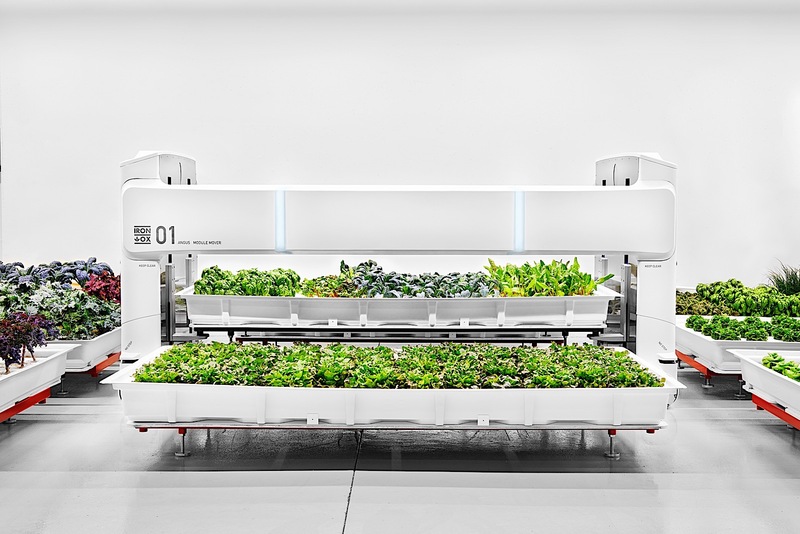 "That means not just adding a robot to an existing process, but engineering everything, including our own hydroponic grow system, around our robots." That includes harvesting, seeding, and plant inspection. "What we found is that the two biggest costs in the indoor farm are labor and electricity," Alexander continued. "Through our new system we're able to do a lot of repetitive tasks more efficiently. But also going forward we'll be using things like greenhouses where we can use sun, which provides energy for free." 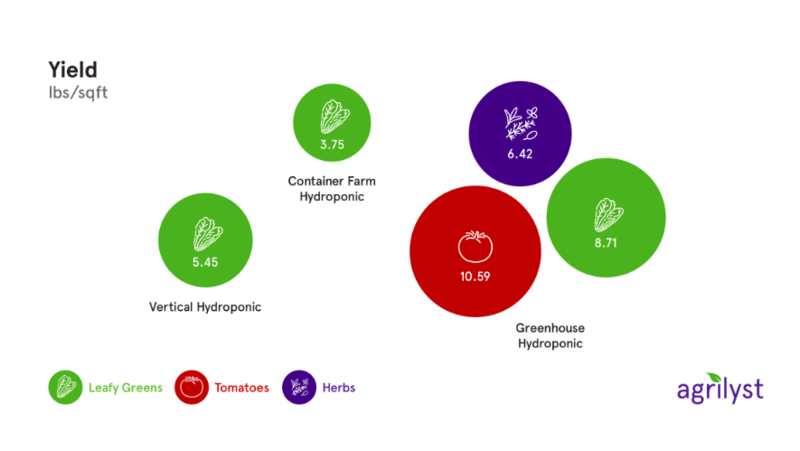 The company's grow modules, for example, are large tubs capable of holding up to 800 pounds of nutrient-balanced fluids in which the plants grow and constitute the core of the company's hydroponics system. "We've laser cut, designed our own wrapping system for [the modules] and even the pots that the plants grow in," Alexander explained. "It's this food safe injection molded plastic that we've developed to be both robot friendly but also allows nice root growth." But rather than expect teams of humans to haul the modules around Iron Ox's 8,000-square-foot facility in San Carlos, California, the company has designed a 1,000-pound robot dubbed Angus to perform the heavy lifting. "Angus' job is to autonomously navigate throughout our greenhouse," Alexander explained. "Find one of these hydroponic grow modules, pick it up, and bring it over to our processing area anytime an operation needs to happen." Angus' movements are controlled by a cloud-based system Alexander calls, "the Brain," which monitors and coordinates actions throughout the growth cycle, from planting to harvesting. Alexander points out that the process is similar to the one Amazon uses in its warehouses, where fleets of Kiva robots scuttle through shelves of products, retrieving them for human workers to pack and ship. "Instead of storage and Harry Potter books, we have these grow modules that are growing lettuce, basil, and so on." And instead of bringing books to human workers, Angus is delivering these huge grow modules to a robotic arm. This arm is no dummy, mind you. It is equipped with a 3D camera that immediately scans every module placed in front of it to confirm the "real-world state of things," according to Alexander. "It uses that information to calculate things like, how do I pick up this plant without hurting the nearby plant? With plants, they're not iPhones, they're not rigid objects, and so you can't just kind of assume everything's going to be 100 percent uniform." The arm is most often used to pick up and transplant seedlings into progressively more spacious tubs. Unfortunately a number of steps do still require a human touch. Iron Ox employs teams of people for "harvesting, and seeding, and packaging because there's no way to do that without damaging the crop," Alexander explained. Still, with less than an acre of space, the company is able to produce 26,000 heads of produce (from more than a dozen varieties) annually. "We don't want just be a premium priced thing that we can only get at the highest end restaurant," Alexander concluded. "At the end of the day, we want to be in the Costcos of the Midwest."